Fujitsu LifeBook T4210 convertible Tablet PC features Intel Core Duo processor, DDR2 667 MHz SDRAM memory slots, 12.1″ XGA (1024×768) active digitizer indoor/outdoor display with wide viewing angles LCD, modular DVD optical drive, integrated 802.11a/b/g Wi-Fi, integrated Gigabit Ethernet LAN, integrated Bluetooth, integrated modem, integrated speakers, integrated fingerprint sensor, dual microphone array with IntelliSonic noise cancellation software, embedded TPM, dedicated Smart Card slot, Fujitsu Security Application Panel and weighs 4.5lbs. TabletPCReviewSpot (dead link) reviews Fujitsu LifeBook T4210 and concludes that Fujitsu T4210 is an exceptionally fast, high-performance Tablet PC in a small package. While we would prefer the “indoor” display option, the T4210 has been a pleasure to use. With its acceptable “real world” standard battery life, top-grade build quality and exceptional built-in security, the T4210 can make a great choice for the mobile professional and student alike. By taking the money you might put towards the indoor/outdoor display option and purchasing the modular bay extended battery instead, you would have a wonderful Tablet PC. 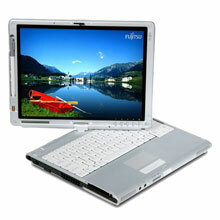 Fujitsu’s unsurpassed support and quality are a considerable part of the package that all consumers should be aware of.